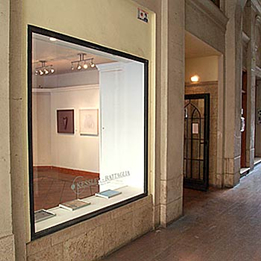 Located in the centre of the city, in a mall that opens onto one of its busiest squares, the Kessler-Battaglia Gallery works as a real and symbolic point of encounter between creators and their audience. Opened in 2002, the Kessler-Battaglia Gallery conbines experience and innovation in management and promotion of both individual and group projects exhibitions. Part of the circuit of creators and exhibitors, the Kessler-Battaglia Gallery sets out to make the sponsor and market functions compatible, acting as an interface between artists and their social and cultural setting. Well aware of the multi-dimensionality of artistic production and of the plural nature of its codes codes and languages, the Kessler-Battaglia Gallery backs both emerging talents and already established creators in the Spanish and international cultural domains. This is in fact an innovative cultural space intended for promoting and disseminating artistic production, as a plastic expression of humanistic commitments and values.